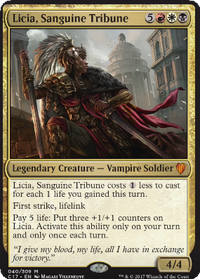 Normally you'd be right, but because Licia, Sanguine Tribune is a CMC 8 creature, Morbid Curiosity draws us 8 cards off 3 mana compared to spells like Night's Whisper . 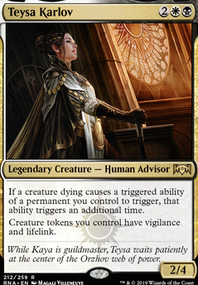 This isn't a voltron strategy deck so I don't mind sacrificing Licia as she works more like a utility commander in this deck and it's easy to get her back on the field anyway. Caltrops with Sydri, Galvanic Genius 's second ability could be a lot of fun though you do have to be careful because your own creatures will get pinged when they attack. 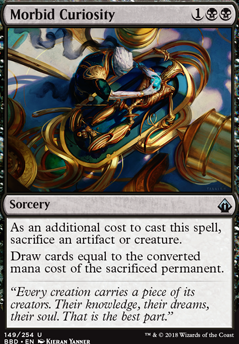 Commander's Sphere is an upgrade over Manalith as your commander can recycle the Sphere for a slow draw engine. Provides some redundancy with the Strix. 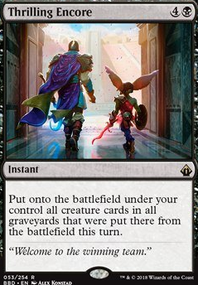 And Aminatou, the Fateshifter is another blink effect on stick to keep you commander getting value from artifacts in the graveyard or just blinking ones in play. Morbid Curiosity is a decent card, it's a good thing to sacrifice Frogmite for. I'll have to consider Metalwork Colossus. Thanks for checking out my Grim-Grin deck. 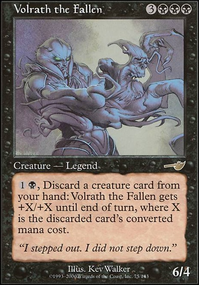 Lord of the Undead can be solid to get your creatures back. Especially those with ETC effects. Dreamborn Muse or Graveborn Muse are possibilities, although you have to be careful with graveborn. 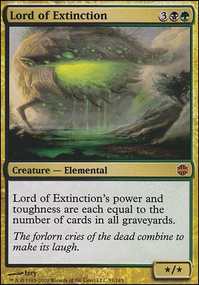 Serum Visions looks like a pretty weak card for Commander. Basically you are paying 1 to scry 2 since the draw just replaces the serum visions you cast. Ambition's Cost, Morbid Curiosity, Promise of Power, or Ancient Craving are better for one off card draw. Cryptbreaker could be fantastic in this deck if you can keep it alive. 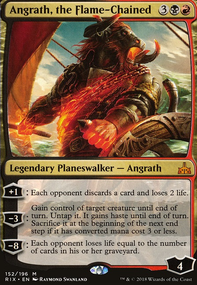 Greed, Grim Haruspex, and Rhystic Study are solid repeatable draw for Commander. Hope some of these suggestions are useful. Good Luck! btw, Morbid Curiosity would be my suggestion of choice. On average i draw like 3-4 cards off it. In dire situations in my Marionette Master deck i'd sacrifice Metalwork Colossus to draw 11 cards. Even if i have to discard a few afterward you definitely get whatever card you were looking for, plus in that deck the colossus works towards the Marionette Master win-con when you pull it from the graveyard.